Two announcements yesterday (April 21) suggest that deep learning algorithms rival human skills in detecting cancer from ultrasound images and in identifying cancer in pathology reports. 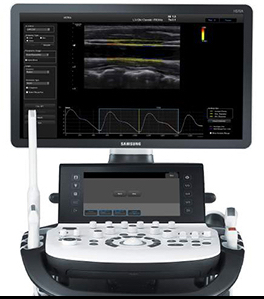 Samsung Medison, a global medical equipment company and an affiliate of Samsung Electronics, has just updated its RS80A ultrasound imaging system with a deep learning algorithm for breast-lesion analysis. “We saw a high level of conformity from analyzing and detecting lesion in various cases by using the S-Detect,” said professor Han Boo Kyung, a radiologist at Samsung Medical Center. Meanwhile, researchers from the Regenstrief Institute and Indiana University School of Informatics and Computing at Indiana University-Purdue University Indianapolis say they’ve found that open-source machine learning tools are as good as — or better than — humans in extracting crucial meaning from free-text (unstructured) pathology reports and detecting cancer cases. The computer tools are also faster and less resource-intensive. “We think that its no longer necessary for humans to spend time reviewing text reports to determine if cancer is present or not,” said study senior author Shaun Grannis*, M.D., M.S., interim director of the Regenstrief Center of Biomedical Informatics. This is especially relevant for underserved nations, where a majority of clinical data is collected in the form of unstructured free text, he said. The researchers sampled 7,000 free-text pathology reports from over 30 hospitals that participate in the Indiana Health Information Exchange and used open source tools, classification algorithms, and varying feature selection approaches to predict if a report was positive or negative for cancer. The results indicated that a fully automated review yielded results similar or better than those of trained human reviewers, saving both time and money. “We found that artificial intelligence was as least as accurate as humans in identifying cancer cases from free-text clinical data. For example the computer ‘learned’ that the word ‘sheet’ or ‘sheets’ signified cancer as ‘sheet’ or ‘sheets of cells’ are used in pathology reports to indicate malignancy. The study was published in the April 2016 issue of the Journal of Biomedical Informatics. It was conducted with support from the Centers for Disease Control and Prevention. Co-authors of the study include researchers at the IU Fairbanks School of Public Health, the IU School of Medicine and the School of Science at IUPUI. * Grannis, a Regenstrief Institute investigator and an associate professor of family medicine at the IU School of Medicine, is the architect of the Regenstrief syndromic surveillance detector for communicable diseases and led the technical implementation of Indiana’s Public Health Emergency Surveillance System — one of the nation’s largest. Studies over the past decade have shown that this system detects outbreaks of communicable diseases seven to nine days earlier and finds four times as many cases as human reporting while providing more complete data. Yann Lecun is Director of AI Research, Facebook and a noted deep-learning expert. • Cancer cases can be identified in unstructured clinical data to support public health reporting. • Such cancer detection methods do not require complex external ontologies or human intervention. • Such approaches can identify cases with sensitivity, specificity, PPV, accuracy, and AUC exceeding 80–90%. 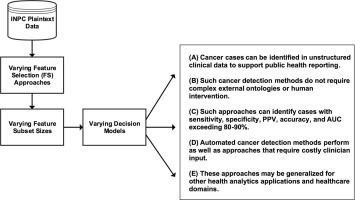 • Automated cancer detection methods perform as well as approaches that require costly clinician input. • These approaches may be generalized for other health analytics applications and healthcare domains. Increased adoption of electronic health records has resulted in increased availability of free text clinical data for secondary use. A variety of approaches to obtain actionable information from unstructured free text data exist. These approaches are resource intensive, inherently complex and rely on structured clinical data and dictionary-based approaches. We sought to evaluate the potential to obtain actionable information from free text pathology reports using routinely available tools and approaches that do not depend on dictionary-based approaches. We obtained pathology reports from a large health information exchange and evaluated the capacity to detect cancer cases from these reports using 3 non-dictionary feature selection approaches, 4 feature subset sizes, and 5 clinical decision models: simple logistic regression, naïve bayes, k-nearest neighbor, random forest, and J48 decision tree. The performance of each decision model was evaluated using sensitivity, specificity, accuracy, positive predictive value, and area under the receiver operating characteristics (ROC) curve. Decision models parameterized using automated, informed, and manual feature selection approaches yielded similar results. Furthermore, non-dictionary classification approaches identified cancer cases present in free text reports with evaluation measures approaching and exceeding 80–90% for most metrics. Our methods are feasible and practical approaches for extracting substantial information value from free text medical data, and the results suggest that these methods can perform on par, if not better, than existing dictionary-based approaches. Given that public health agencies are often under-resourced and lack the technical capacity for more complex methodologies, these results represent potentially significant value to the public health field. Scientists at Nanyang Technological University (NTU Singapore) have invented a new way to deliver cancer drugs deep into tumor cells. They created micro-sized gas bubbles coated with anticancer drug particles embedded in iron oxide nanoparticles and used MRI or other magnetic sources to direct these microbubbles to gather around a specific tumor. Then they used ultrasound to vibrate the microbubbles, providing the energy to direct the drug particles into a targeted kill zone in the tumor. The magnetic nanoparticles also allow for imaging in an MRI machine. The microbubbles were successfully tested in mice and the study has been published by the Nature Publishing Group in Asia Materials. This innovative technique was developed by a multidisciplinary team of scientists led by Asst Prof C. J. Xu from the School of Chemical and Biomedical Engineering and Assoc. Prof Claus-Dieter Ohl from the School of Physical and Mathematical Sciences. Xu, who is also a researcher at the NTU-Northwestern Institute for Nanomedicine, said their new method may solve some of the most pressing problems faced in chemotherapy used to treat cancer. The main problem is that current chemotherapy drugs cannot be easily targeted. The drug particles flow in the bloodstream, damaging both healthy and cancerous cells. Typically, these drugs are flushed away quickly in organs such as the lungs and liver, limiting their effectiveness. The remaining drugs are also unable to penetrate deep into the core of the tumor, leaving some cancer cells alive, which could lead to a resurgence in tumor growth. The microbubbles are magnetic, so after injecting them into the bloodstream, they can be clustered around the tumor using magnets to ensure that they don’t kill the healthy cells, explains Xu, who has been working on cancer diagnosis and drug delivery systems since 2004. According to Clinical Associate Professor Chia Sing Joo, a Senior Consultant at the Tan Tock Seng Hospital’s Endoscopy Centre and the Urology & Continence Clinic, “For anticancer drugs to achieve their best effectiveness, they need to penetrate into the tumor efficiently in order to reach the cytoplasm of all the cancer cells that are being targeted without affecting the normal cells. “Currently, this can [only] be achieved by means of a direct injection into the tumor or by administering a large dosage of anticancer drugs, which can be painful, expensive, impractical and might have various side effects. If successful, I envisage [the new drug-delivery system] can be a good alternative treatment in the future, one which is low cost and yet effective for the treatment of cancers involving solid tumors, as it might minimize the side effects of drugs.” Joo is a surgeon experienced in the treatment of prostate, bladder and kidney cancer and a consultant for this study. The 12-person study team included scientists from City University of Hong Kong and Technion – Israel Institute of Technology (Technion). The team plans to use this new drug delivery system in studies on lung and liver cancer using animal models, and eventually clinical studies. They estimate that it will take another eight to ten years before it reaches human clinical trials. 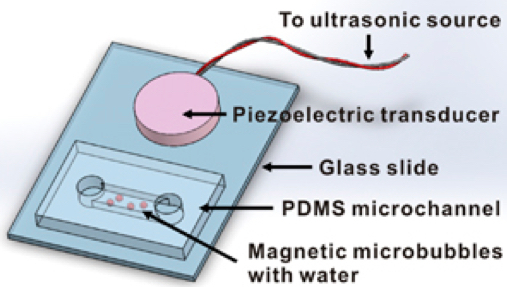 Magnetic microbubbles (MMBs) are microbubbles (MBs) coated with magnetic nanoparticles (NPs). MMBs not only maintain the acoustic properties of MBs, but also serve as an important contrast agent for magnetic resonance imaging. Such dual-modality functionality makes MMBs particularly useful for a wide range of biomedical applications, such as localized drug/gene delivery. This article reports the ability of MMBs to release their particle cargo on demand under stable oscillation. When stimulated by ultrasound at resonant frequencies, MMBs of 450 nm to 200 μm oscillate in volume and surface modes. Above an oscillation threshold, NPs are released from the MMB shell and can travel hundreds of micrometers from the surface of the bubble. The migration of NPs from MMBs can be described with a force balance model. With this technology, we deliver doxorubicin-containing poly(lactic-co-glycolic acid) particles across a physiological barrier bothin vitro and in vivo, with a 18-fold and 5-fold increase in NP delivery to the heart tissue of zebrafish and tumor tissue of mouse, respectively. The penetration of released NPs in tissues is also improved. The ability to remotely control the release of NPs from MMBs suggests opportunities for targeted drug delivery through/into tissues that are not easily diffused through or penetrated. A Dartmouth College scientist and his collaborators* have created the first high-resolution co-assembly between a protein and buckminsterfullerene (C60), aka fullerene and buckyball (a sphere-like molecule composed of 60 carbon atoms and shaped like a soccer ball). “This is a proof-of-principle study demonstrating that proteins can be used as effective vehicles for organizing nanomaterials by design,” says senior author Gevorg Grigoryan, an assistant professor of computer science at Dartmouth and senior author of a study discussed in an open-access paper in the journal in Nature Communications. Proteins organize and orchestrate essentially all molecular processes in our cells. The goal of the new study was to create a new artificial protein that can direct the self-assembly of fullerene into ordered superstructures. Grigoryan and his colleagues show that that their artificial protein organizes a fullerene into a lattice called C60Sol–COP. COP, a protein that is a stable tetramer (a polymer derived from four identical single molecules), interacted with fullerene molecules via a surface-binding site and further self-assembled into an ordered crystalline superstructure. Interestingly, the superstructure exhibits high charge conductance, whereas both the protein-alone crystal and amorphous C60 are electrically insulating. Grigoryan says that if we learn to do the programmable self-assembly of precisely organized molecular building blocks more generally, it will lead to a range of new materials with properties such as higher strength, lighter weight, and greater chemical reactivity, resulting in a host of applications, from medicine to energy and electronics. 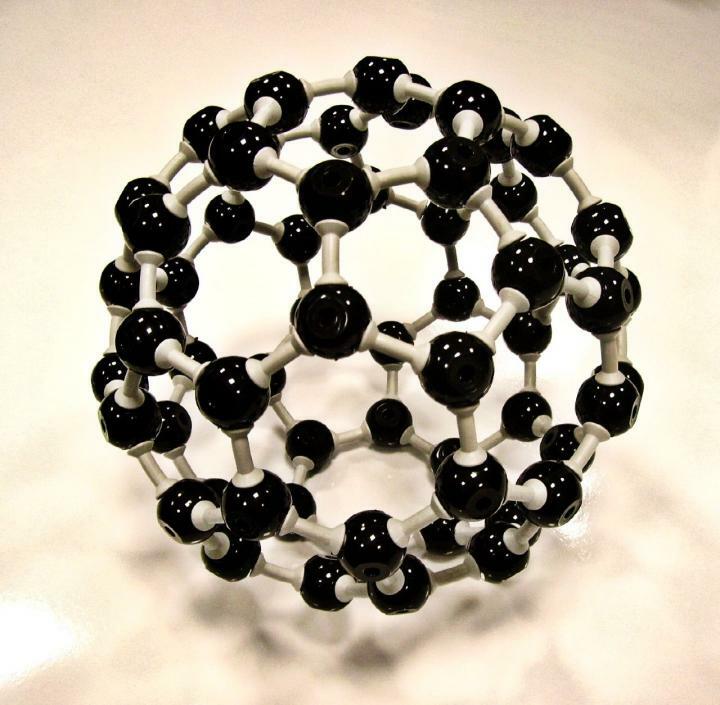 Fullerenes are currently used in nanotechnology because of their high heat resistance and electrical superconductivity (when doped), but the molecule has been difficult to organize in useful ways. * The study also included researchers from Dartmouth College, Sungkyunkwan University, the New Jersey Institute of Technology, the National Institute of Science Education and Research, the University of California-San Francisco, the University of Pennsylvania, and the Institute for Basic Science. Learning to engineer self-assembly would enable the precise organization of molecules by design to create matter with tailored properties. Here we demonstrate that proteins can direct the self-assembly of buckminsterfullerene (C60) into ordered superstructures. A previously engineered tetrameric helical bundle binds C60 in solution, rendering it water soluble. Two tetramers associate with one C60, promoting further organization revealed in a 1.67-Å crystal structure. Fullerene groups occupy periodic lattice sites, sandwiched between two Tyr residues from adjacent tetramers. Strikingly, the assembly exhibits high charge conductance, whereas both the protein-alone crystal and amorphous C60 are electrically insulating. The affinity of C60 for its crystal-binding site is estimated to be in the nanomolar range, with lattices of known protein crystals geometrically compatible with incorporating the motif. Taken together, these findings suggest a new means of organizing fullerene molecules into a rich variety of lattices to generate new properties by design. Programmable self-assembly of molecular building blocks is a highly desirable way of achieving bottom-up control over novel functions and materials. Applications of molecular assemblies are well explored in the literature, ranging from optoelectronic1, 2, magnetic3, and photovoltaic4 devices to chemical and bioanalytical sensing5, and medicine6. However, it has been a daunting challenge to quantitatively describe and control the driving forces that govern self-assembly, particularly given the broad range of molecular building blocks one would like to organize. In this respect, nature’s self-assembling macromolecules hold considerable promise as standard chassis for encoding precise organization. By learning to engineer the assembly of these molecules, myriad other molecular building blocks can be co-organized in desired ways through non-covalent or covalent attachment. The protein polymer is a particularly attractive candidate for a standard assembly chassis given its rich chemical alphabet, diversity of available assembly geometries, broad ability to engage other molecular moieties, and the possibility of engineered function. Considerable progress has been made in the area of engineering protein assemblies7, 8, using either computational9, 10,11, 12, 13, 14 or rational approaches15, 16, 17, 18, but the problem remains a grand challenge. A major difficulty lies in accounting for the enormous continuum of possible assembly geometries available to proteins to engineer a sequence that predictably prefers just one. General design principles, which provide predictive rules of assembly, are thus of enormous utility in limiting the geometric search space and enabling robust design11, 19. In this work, we demonstrate the first ever high-resolution structure of co-assembly between a protein and buckminsterfullerene (C60), which suggests a simple structural mode for protein–fullerene co-organization. Three separate crystal structures, resolved to 1.67, 1.76 and 2.35 Å, reveal a protein lattice with C60 groups occupying periodic sites wedged between two helical segments, each donating a Tyr residue. A half site of the motif is estimated to have nM-scale affinity for C60, such that binding of fullerene appears to direct the organization of protein units in the co-crystal. The assembly exhibits a nm-spaced helical arrangement of fullerenes along a crystallographic axis, endowing the crystal with electrical conductance properties. We closely investigate the interfacial geometry of the C60-binding motif, finding it to be common among protein crystal lattices. C60 and its derivatives have been previously reported to interact with several proteins20, 21, 22, 23, 24, 25, although a high-resolution structure of a protein–C60 has been lacking. Still, prior evidence of interaction indicates that fullerenes and proteins are compatible as materials. This, together with the simple (and naturally recurrent) geometry of the C60-binding motif we discover, suggests that it may be possible to use the structural principles emergent from our study to generate a variety of C60–protein co-assemblies to further explore and exploit the properties of fullerenes26. The aim of programmable self-assembly is to anticipate and harness unique collective properties that arise from precisely organized molecular building blocks. To this end, achieving atomic-level precision is crucial. This work demonstrates the first atomic resolution structures of a fullerene–protein assembly, establishing the feasibility of creating such objects, and further suggests a possible design principle for engineering such assemblies in general. How robust the discovered C60-binding motif is towards designing novel assemblies will need to be tested through a number of future design studies. However, the straightforward manner in which self-organization arose in our case, the simplicity of the C60-organizing motif in the lattice, together with its high affinity and the ubiquity of associated interfaces in natural protein lattices, are certainly promising with respect to the general applicability of the design principle. Our work also demonstrates the potential utility of exploring C60/protein co-organization, as derived supercrystals already showed synergistic charge conductance properties. Taken together, these results point to an exciting direction of inquiry towards generating protein–fullerene assemblies for the study and design of novel properties. Scientists at the Gladstone Institutes have used chemicals to transform skin cells into heart cells and brain cells, instead of adding external genes — making this accomplishment a breakthrough, according to the scientists. The research lays the groundwork for one day being able to regenerate lost or damaged cells directly with pharmaceutical drugs — a more efficient and reliable method to reprogram cells and one that avoids medical concerns surrounding genetic engineering. Instead, in two studies published in an open-access paper in Science and in Cell Stem Cell, the team of scientists at the Roddenberry Center for Stem Cell Biology and Medicine at Gladstone used chemical cocktails to gradually coax skin cells to change into organ-specific stem-cell-like cells and ultimately into heart or brain cells. Transplanted adult heart cells do not survive or integrate properly into the heart and few stem cells can be coaxed into becoming heart cells. Instead, in the Science study, the researchers used a cocktail of nine chemicals to change human skin cells into beating heart cells. By trial and error, they found the best combination of chemicals to begin the process by changing the cells into a state resembling multipotent stem cells (cells that can turn into many different types of cells in a particular organ). A second cocktail of chemicals and growth factors then helped transition the cells to become heart muscle cells. With this method, more than 97% of the cells began beating, a characteristic of fully developed, healthy heart cells. 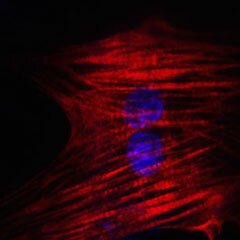 The cells also responded appropriately to hormones, and molecularly, they resembled heart muscle cells, not skin cells. What’s more, when the cells were transplanted into a mouse heart early in the process, they developed into healthy-looking heart muscle cells within the organ. In the second study, authored by Gladstone postdoctoral scholar Mingliang Zhang, PhD, and published in Cell Stem Cell, the scientists created neural stem-cell-like cells from mouse skin cells using a similar approach. The chemical cocktail again consisted of nine molecules, some of which overlapped with those used in the first study. Over ten days, the cocktail changed the identity of the cells, until all of the skin-cell genes were turned off and the genes of the neural stem-cell-like cells were gradually turned on. When transplanted into mice, the neural stem-cell-like cells spontaneously developed into the three basic types of brain cells: neurons, oligodendrocytes, and astrocytes. 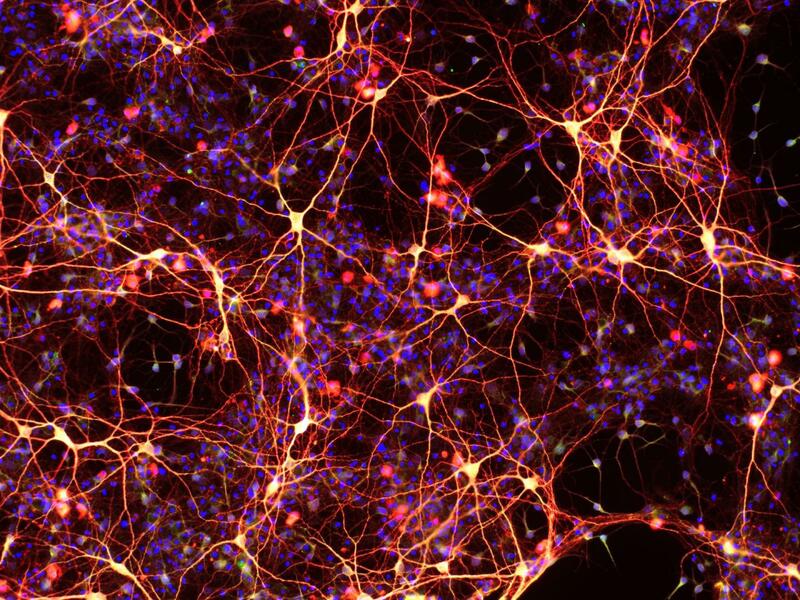 The neural stem-cell-like cells were also able to self-replicate, making them ideal for treating neurodegenerative diseases or brain injury. Reprogramming somatic fibroblasts into alternative lineages would provide a promising source of cells for regenerative therapy. However, transdifferentiating human cells to specific homogeneous, functional cell types is challenging. Here we show that cardiomyocyte-like cells can be generated by treating human fibroblasts with a combination of nine compounds (9C). The chemically induced cardiomyocyte-like cells (ciCMs) uniformly contracted and resembled human cardiomyocytes in their transcriptome, epigenetic, and electrophysiological properties. 9C treatment of human fibroblasts resulted in a more open-chromatin conformation at key heart developmental genes, enabling their promoters/enhancers to bind effectors of major cardiogenic signals. When transplanted into infarcted mouse hearts, 9C-treated fibroblasts were efficiently converted to ciCMs. This pharmacological approach for lineage-specific reprogramming may have many important therapeutic implications after further optimization to generate mature cardiac cells. Cellular reprogramming using chemically defined conditions, without genetic manipulation, is a promising approach for generating clinically relevant cell types for regenerative medicine and drug discovery. However, small-molecule approaches for inducing lineage-specific stem cells from somatic cells across lineage boundaries have been challenging. Here, we report highly efficient reprogramming of mouse fibroblasts into induced neural stem cell-like cells (ciNSLCs) using a cocktail of nine components (M9). The resulting ciNSLCs closely resemble primary neural stem cells molecularly and functionally. Transcriptome analysis revealed that M9 induces a gradual and specific conversion of fibroblasts toward a neural fate. During reprogramming specific transcription factors such as Elk1 and Gli2 that are downstream of M9-induced signaling pathways bind and activate endogenous master neural genes to specify neural identity. Our study provides an effective chemical approach for generating neural stem cells from mouse fibroblasts and reveals mechanistic insights into underlying reprogramming processes. A research group at VU University Amsterdam (The Netherlands) has shown that an ultrafast laser technique can reveal exactly where brain tumors are, producing images in less than a minute and enabling surgeons to removetumors without compromising healthy tissue. Pathologists typically use staining methods, in which chemicals like hematoxylin and eosin turn different tissue components blue and red, revealing its structure and whether there are any tumor cells. But for a definitive diagnosis, this process can take up to 24 hours—which means surgeons may not realize some cancerous tissue has escaped from their attention until after surgery, requiring a second operation and more risk. But the research team’s new ultrafast laser technique is label-free—instead, they fire short, 20-fs-long laser pulses into the tissue, and when three photons converge at the same time and place, the photons interact with the nonlinear optical properties of the tissue. Through well-known phenomena in optics called second- and third-harmonic generation, these interactions produce a single photon. The key is that the incoming and outgoing photons have different wavelengths. The incoming photons are at 1200 nm, long enough to penetrate deep into the tissue. The single photon that is produced, however, is at 600 or 400 nm, depending on if it’s second- or third-harmonic generation. The shorter wavelengths mean the photon can scatter in the tissue. The scattered photon thus contains information about the tissue, and when it reaches a detector—in this case, a high-sensitivity gallium arsenide phosphide (GaAsP) photomultiplier tube—it reveals what the tissue looks like inside. The research team used the technique to analyze glial brain tumors, which are particularly deadly because it’s hard to get rid of tumor cells by surgery, irradiation, and chemotherapy without substantial collateral damage to the surrounding brain tissue. They tested their method on samples of glial brain tumors from humans, finding that the histological detail in these images was as good—if not better—than those made with conventional staining techniques. They were able to make most images in under a minute. The smaller ones took less than a second, while larger images of a few square millimeters took five minutes—making it possible to do it in real time in the operating room, according to Marloes Groot of VU University Amsterdam, who led the work. Now that they’ve shown their approach works, the researchers are developing a handheld device that a surgeon can use to identify a tumor’s border during surgery. The incoming laser pulses can only reach a depth of about 100 µm into the tissue. To reach farther, Groot envisions attaching a needle that can pierce the tissue and deliver photons deeper, allowing diagnosis during an operation and possibly before surgery begins. Full details of the work appear in the journal Biomedical Optics Express; for more information, please visit http://dx.doi.org/10.1364/boe.7.001889. In brain tumor surgery, recognition of tumor boundaries is key. However, intraoperative assessment of tumor boundaries by the neurosurgeon is difficult. Therefore, there is an urgent need for tools that provide the neurosurgeon with pathological information during the operation. We show that third harmonic generation (THG) microscopy provides label-free, real-time images of histopathological quality; increased cellularity, nuclear pleomorphism, and rarefaction of neuropil in fresh, unstained human brain tissue could be clearly recognized. We further demonstrate THG images taken with a GRIN objective, as a step toward in situ THG microendoscopy of tumor boundaries. THG imaging is thus a promising tool for optical biopsies. A new one-atom-thick flat material made up of silicon, boron, and nitrogen can function as a conductor or semiconductor (unlike graphene) and could upstage graphene and advance digital technology, say scientists at the University of Kentucky, Daimler in Germany, and the Institute for Electronic Structure and Laser (IESL) in Greece. Reported in Physical Review B, Rapid Communications, the new Si2BN material was discovered in theory (not yet made in the lab). It uses light, inexpensive earth-abundant elements and is extremely stable, a property many other graphene alternatives lack, says University of Kentucky Center for Computational Sciences physicist Madhu Menon, PhD. A search for new 2D semiconducting materials has led researchers to a new class of three-layer materials called transition-metal dichalcogenides (TMDCs). TMDCs are mostly semiconductors and can be made into digital processors with greater efficiency than anything possible with silicon. However, these are much bulkier than graphene and made of materials that are not necessarily earth-abundant and inexpensive. 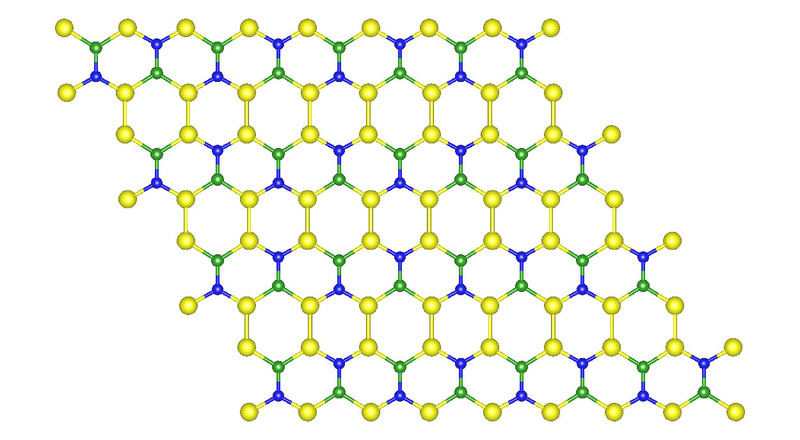 Other graphene-like materials have been proposed but lack the strengths of the new material. Silicene, for example, does not have a flat surface and eventually forms a 3D surface. Other materials are highly unstable, some only for a few hours at most. The new Si2BN material is metallic, but by attaching other elements on top of the silicon atoms, its band gap can be changed (from conductor to semiconductor, for example) — a key advantage over graphene for electronics applications and solar-energy conversion. The presence of silicon also suggests possible seamless integration with current silicon-based technology, allowing the industry to slowly move away from silicon, rather than precipitously, notes Menon. While the possibility to create a single-atom-thick two-dimensional layer from any material remains, only a few such structures have been obtained other than graphene and a monolayer of boron nitride. Here, based upon ab initiotheoretical simulations, we propose a new stable graphenelike single-atomic-layer Si2BN structure that has all of its atoms with sp2 bonding with no out-of-plane buckling. The structure is found to be metallic with a finite density of states at the Fermi level. This structure can be rolled into nanotubes in a manner similar to graphene. Combining first- and second-row elements in the Periodic Table to form a one-atom-thick material that is also flat opens up the possibility for studying new physics beyond graphene. The presence of Si will make the surface more reactive and therefore a promising candidate for hydrogen storage. Researchers at at RMIT University in Australia have developed a cheap, efficient way to grow special copper- and silver-based nanostructures on textiles that can degrade organic matter when exposed to light. Don’t throw out your washing machine yet, but the work paves the way toward nano-enhanced textiles that can spontaneously clean themselves of stains and grime simply by being put under a light or worn out in the sun. 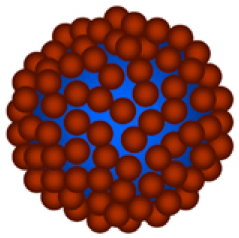 The nanostructures absorb visible light (via localized surface plasmon resonance — collective electron-charge oscillations in metallic nanoparticles that are excited by light), generating high-energy (“hot”) electrons that cause the nanostructures to act as catalysts for chemical reactions that degrade organic matter. The challenge for researchers has been to bring the concept out of the lab by working out how to build these nanostructures on an industrial scale and permanently attach them to textiles. The RMIT team’s novel approach was to grow the nanostructures directly onto the textiles by dipping them into specific solutions, resulting in development of stable nanostructures within 30 minutes. When exposed to light, it took less than six minutes for some of the nano-enhanced textiles to spontaneously clean themselves. The research was described in the journal Advanced Materials Interfaces. Rajesh Ramanathan, a RMIT postdoctoral fellow and co-senior author, said the process also had a variety of applications for catalysis-based industries such as agrochemicals, pharmaceuticals, and natural products, and could be easily scaled up to industrial levels. “The advantage of textiles is they already have a 3D structure, so they are great at absorbing light, which in turn speeds up the process of degrading organic matter,” he said. “Our next step will be to test our nano-enhanced textiles with organic compounds that could be more relevant to consumers, to see how quickly they can handle common stains like tomato sauce or wine,” Ramanathan said. Inspired by high porosity, absorbency, wettability, and hierarchical ordering on the micrometer and nanometer scale of cotton fabrics, a facile strategy is developed to coat visible light active metal nanostructures of copper and silver on cotton fabric substrates. The fabrication of nanostructured Ag and Cu onto interwoven threads of a cotton fabric by electroless deposition creates metal nanostructures that show a localized surface plasmon resonance (LSPR) effect. The micro/nanoscale hierarchical ordering of the cotton fabrics allows access to catalytically active sites to participate in heterogeneous catalysis with high efficiency. The ability of metals to absorb visible light through LSPR further enhances the catalytic reaction rates under photoexcitation conditions. Understanding the modes of electron transfer during visible light illumination in Ag@Cotton and Cu@Cotton through electrochemical measurements provides mechanistic evidence on the influence of light in promoting electron transfer during heterogeneous catalysis for the first time. The outcomes presented in this work will be helpful in designing new multifunctional fabrics with the ability to absorb visible light and thereby enhance light-activated catalytic processes. Duke University researchers have discovered a new form of MRI that’s 10,000 times more sensitive and could record actual biochemical reactions, such as those involved in cancer and heart disease, and in real time. Let’s review how MRI (magnetic resonance imaging) works: MRI takes advantage of a property called spin, which makes the nuclei in hydrogen atoms act like tiny magnets. By generating a strong magnetic field (such as 3 Tesla) and a series of radio-frequency waves, MRI induces these hydrogen magnets in atoms to broadcast their locations. Since most of the hydrogen atoms in the body are bound up in water, the technique is used in clinical settings to create detailed images of soft tissues like organs (such as the brain), blood vessels, and tumors inside the body. MRI’s ability to track chemical transformations in the body has been limited by the low sensitivity of the technique. That makes it impossible to detect small numbers of molecules (without using unattainably more massive magnetic fields). So to take MRI a giant step further in sensitivity, the Duke researchers created a new class of molecular “tags” that can track disease metabolism in real time, and can last for more than an hour, using a technique called hyperpolarization. * These tags are biocompatible and inexpensive to produce, allowing for using existing MRI machines. The new molecular tags open up a new world for medicine and research by making it possible to detect what’s happening in optically opaque tissue instead of requiring expensive positron emission tomography (PET), which uses a radioactive tracer chemical to look at organs in the body and only works for (typically) about 20 minutes, or CT x-rays, according to the researchers. This research was reported in the March 25 issue of Science Advances. It was supported by the National Science Foundation, the National Institutes of Health, the Department of Defense Congressionally Directed Medical Research Programs Breast Cancer grant, the Pratt School of Engineering Research Innovation Seed Fund, the Burroughs Wellcome Fellowship, and the Donors of the American Chemical Society Petroleum Research Fund. * For the past decade, researchers have been developing methods to “hyperpolarize” biologically important molecules. “Hyperpolarization gives them 10,000 times more signal than they would normally have if they had just been magnetized in an ordinary magnetic field,” Warren said. But while promising, Warren says these hyperpolarization techniques face two fundamental problems: incredibly expensive equipment — around 3 million dollars for one machine — and most of these molecular “lightbulbs” burn out in a matter of seconds. So the researchers synthesized a series of molecules containing diazarines — a chemical structure composed of two nitrogen atoms bound together in a ring. Diazirines were a promising target for screening because their geometry traps hyperpolarization in a “hidden state” where it cannot relax quickly. 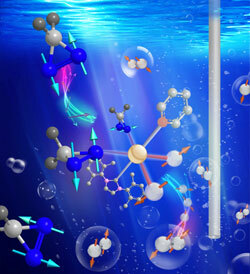 Using a simple and inexpensive approach to hyperpolarization called SABRE-SHEATH, in which the molecular tags are mixed with a spin-polarized form of hydrogen and a catalyst, the researchers were able to rapidly hyperpolarize one of the diazirine-containing molecules, greatly enhancing its magnetic resonance signals for over an hour. The scientists believe their SABRE-SHEATH catalyst could be used to hyperpolarize a wide variety of chemical structures at a fraction of the cost of other methods. Conventional magnetic resonance (MR) faces serious sensitivity limitations, which can be overcome by hyperpolarization methods, but the most common method (dynamic nuclear polarization) is complex and expensive, and applications are limited by short spin lifetimes (typically seconds) of biologically relevant molecules. We use a recently developed method, SABRE-SHEATH, to directly hyperpolarize 15N2 magnetization and long-lived 15N2singlet spin order, with signal decay time constants of 5.8 and 23 min, respectively. We find >10,000-fold enhancements generating detectable nuclear MR signals that last for more than an hour. 15N2-diazirines represent a class of particularly promising and versatile molecular tags, and can be incorporated into a wide range of biomolecules without significantly altering molecular function. University of Michigan Medical School researchers have discovered a way to convert mouse stem cells (taken from an embryo) that have become “primed” (reached the stage where they can differentiate, or develop into every specialized cell in the body) to a “naïve” (unspecialized) state by simply adding a drug. This breakthrough has the potential to one day allow researchers to avoid the ethically controversial use of human embryos left over from infertility treatments. To achieve this breakthrough, the researchers treated the primedembryonic stem cells (“EpiSC”) with a drug called MM-401* (a leukemia drug) for a short period of time. * The drug, MM-401, specifically targets epigenetic chemical markers on histones, the protein “spools” that DNA coils around to create structures called chromatin. These epigenetic changes signal the cell’s DNA-reading machinery and tell it where to start uncoiling the chromatin in order to read it. A gene called Mll1 is responsible for the addition of these epigenetic changes, which are like small chemical tags called methyl groups. Mll1 plays a key role in the uncontrolled explosion of white blood cells in leukemia, which is why researchers developed the drug MM-401 to interfere with this process. But Mll1 also plays a role in cell development and the formation of blood cells and other cells in later-stage embryos. 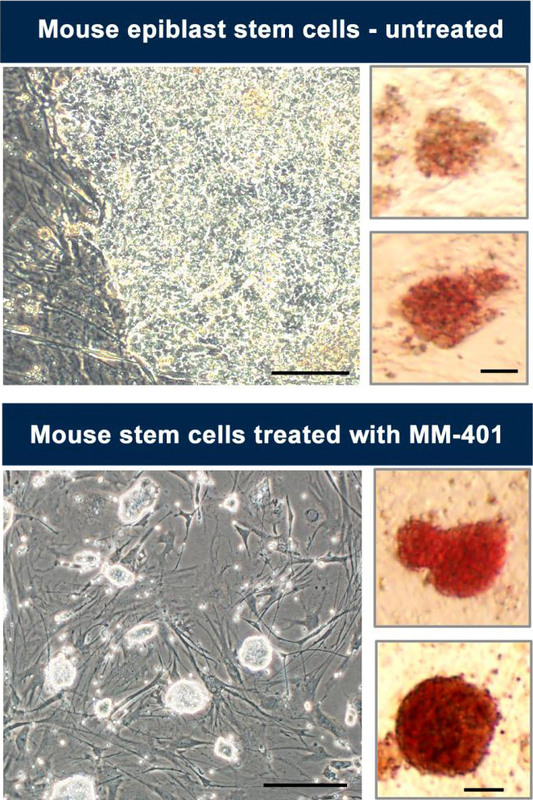 Stem cells do not turn on the Mll1 gene until they are more developed. The MM-401 drug blocks Mll1’s normal activity in developing cells so the epigenetic chemical markers are missing. These cells are then unable to continue to develop into different types of specialized cells but are still able to revert to healthy naive pluripotent stem cells. The interconversion between naive and primed pluripotent states is accompanied by drastic epigenetic rearrangements. However, it is unclear whether intrinsic epigenetic events can drive reprogramming to naive pluripotency or if distinct chromatin states are instead simply a reflection of discrete pluripotent states. Here, we show that blocking histone H3K4 methyltransferase MLL1 activity with the small-molecule inhibitor MM-401 reprograms mouse epiblast stem cells (EpiSCs) to naive pluripotency. This reversion is highly efficient and synchronized, with more than 50% of treated EpiSCs exhibiting features of naive embryonic stem cells (ESCs) within 3 days. Reverted ESCs reactivate the silenced X chromosome and contribute to embryos following blastocyst injection, generating germline-competent chimeras. Importantly, blocking MLL1 leads to global redistribution of H3K4me1 at enhancers and represses lineage determinant factors and EpiSC markers, which indirectly regulate ESC transcription circuitry. These findings show that discrete perturbation of H3K4 methylation is sufficient to drive reprogramming to naive pluripotency. 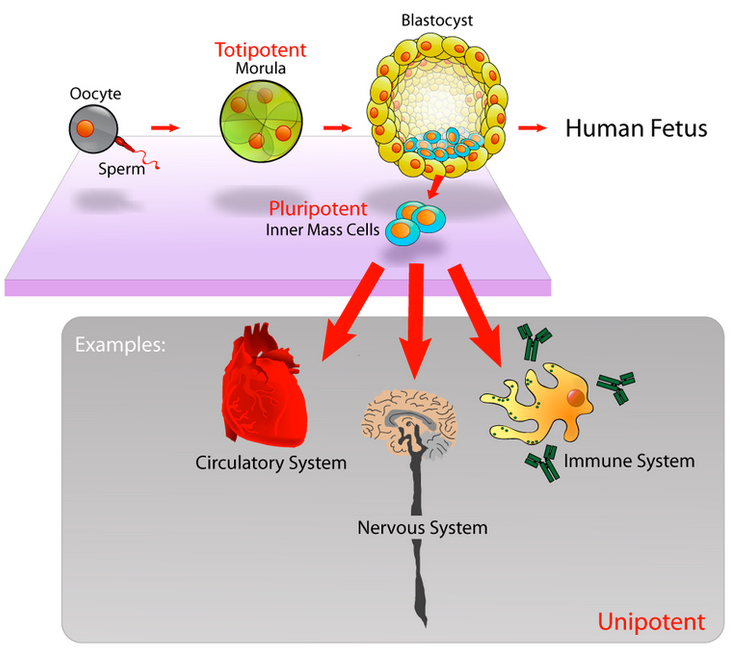 Conventional generation of stem cells from human blastocysts produces a developmentally advanced, or primed, stage of pluripotency. In vitro resetting to a more naive phenotype has been reported. However, whether the reset culture conditions of selective kinase inhibition can enable capture of naive epiblast cells directly from the embryo has not been determined. Here, we show that in these specific conditions individual inner cell mass cells grow into colonies that may then be expanded over multiple passages while retaining a diploid karyotype and naive properties. The cells express hallmark naive pluripotency factors and additionally display features of mitochondrial respiration, global gene expression, and genome-wide hypomethylation distinct from primed cells. They transition through primed pluripotency into somatic lineage differentiation. Collectively these attributes suggest classification as human naive embryonic stem cells. Human counterparts of canonical mouse embryonic stem cells would argue for conservation in the phased progression of pluripotency in mammals.